PNW PGA Junior Championship – Juniors sign up today! 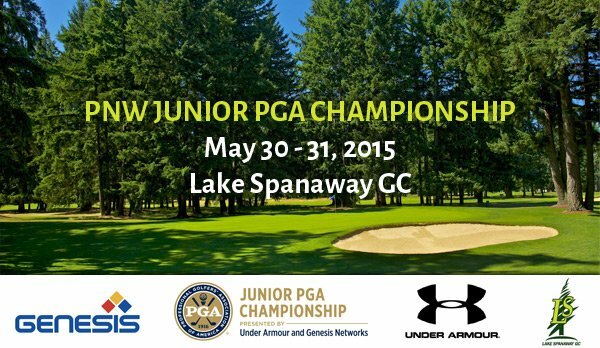 We are now accepting entries for the 2015 Pacific Northwest Section Junior PGA Championship Qualifier at Lake Spanaway GC on May 30 – May 31. Please let your junior golfer’s at your club know about our upcoming tournament in the coming months. It’s a wonderful opportunity for your junior golfers to become involved in competitive golf. Championship Qualifier Information: A stroke play competition based on the lowest gross scores. The age divisions are: 12 & Under, 13-15, and 16-18. *Any junior who wishes to qualify for the Junior PGA Championship must play 36 holes from the same tees as the 16-18 year old age division. If a junior is interested in trying to advance, they do have the option to play in the 16-18 age division. The winning Boy and Girl Champion from each of the 41 PGA Sections will participate in the Junior PGA Championship held August 3-6, 2015 (Practice Rounds August 1-2) at Miramont Country Club in Bryan, Texas. Section Champions are identified based on the lowest gross score in the 16-18 age division. About Lake Spanaway: The 18 hole, championship layout Lake Spanaway, designed by legendary A. V. Macan, (who also designed, among others, Fircrest in Tacoma, Broadmoor and Inglewood in Seattle, and Royal Colwood in Victoria), opened in 1967 and is located at 15602 Pacific Avenue in Spanaway, a community south of Tacoma in central Pierce County adjacent to Spanaway Lake. The course has been recognized on a national level and consistently ranks as one of the top courses in the Pacific Northwest. CLICK HERE for the 2015 Pacific Northwest Section Junior PGA Championship Qualifier entry.